As Henry Ford’s only son, it’s little surprise that Edsel Bryant Ford developed strong feelings about automobiles from an early age. Edsel received his first car on his 10th birthday in November 1903 and at the age of 16, an early exercise in hot-rodding cost him part of a finger. As a teenager, Edsel collected press clippings and photographs of interesting cars, supplemented with his own automotive sketches. By the time he was an adult, his interests had expanded to include boating, painting, and photography; after his marriage in 1916 to Eleanor Lowthian Clay, he became an art connoisseur of some note. Nonetheless, cars would remain one of Edsel’s great passions throughout his life. Although Edsel was the nominal president of the Ford Motor Company from December 30, 1918, until his death in 1943, his actual power was more limited than the title would imply. Edsel generally had authority over sales, marketing, and administrative functions such as purchasing, but engineering and production remained the domain of his father and senior managers like Ed Martin and Charlie Sorensen. Edsel’s influence was not negligible, but his ventures into those areas appear to have been politically fraught. Bob Gregorie, later to become Ford’s first design director, thought some company officials saw Edsel as a figure to be placated more than obeyed. 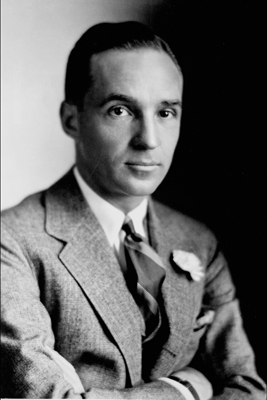 Furthermore, Edsel could not necessarily count on his father to back him up; Henry Ford would sometimes contradict or even criticize Edsel in front of their employees, something the elder Ford later told Harry Bennett was intended to prod his reserved, soft-spoken son into becoming tougher and more assertive. An area where Edsel could exercise far greater control was Lincoln, which Ford had acquired in 1922. Bob Gregorie later speculated that part of Henry Ford’s motivation in buying Lincoln was to keep Edsel occupied. Edsel, in turn, used Lincoln to develop ideas he hoped to persuade his father to eventually introduce on the Ford line. Lincoln also became an early outlet for Edsel’s continuing interest in styling. He selected the coachbuilders who provided Lincoln bodies and offered considerable input on their designs. With the exception of a few high-end coachbuilt cars, early automobiles tended to be decorated more than actually styled and even color choices were usually sharply limited. However, as the automotive market matured, appearance became increasingly crucial and that importance gave Edsel Ford a new role. His influence over Ford design was visible in the final 1926-1927 Model T and became more pronounced with the introduction of the Model A in 1928, which incorporated not only Lincoln-esque styling, but also some Lincoln technologies, such as a conventional three-speed gearbox. Styling was not a subject in which Henry Ford usually took much interest, but he soon came to respect his son’s judgment in that area. By the early thirties, Edsel was effectively responsible for overseeing Ford design. Today, we tend to think of automotive design chiefs as stylists who’ve moved up the ranks to managerial positions, but before World War II, it was not uncommon for styling directors to be administrators with little or no formal training or design experience. Even those who had a design background, like GM’s Harley Earl, often had little hands-on involvement after assuming a managerial role. As Bob Gregorie later noted, one doesn’t have to be an artist to offer valid criticism and direction. It was in the latter capacity that Edsel Ford proved his mettle. While he offered feedback and suggestion on automotive designs, he left their execution to others. Even so, Ford’s products of the thirties and early forties reflected Edsel’s aesthetic sensibility. His tastes reflected his personality: neat, understated, fundamentally conservative, but always very refined. According to Gregorie, Edsel preferred sharp forms to blunt ones, delicacy to bulk, and a restrained use of trim; Edsel had little appetite for the chrome frosting favored by contemporary GM designers. While it would be fair to say that Edsel had design authority at Ford by the early thirties, the company did not yet have a true styling department. 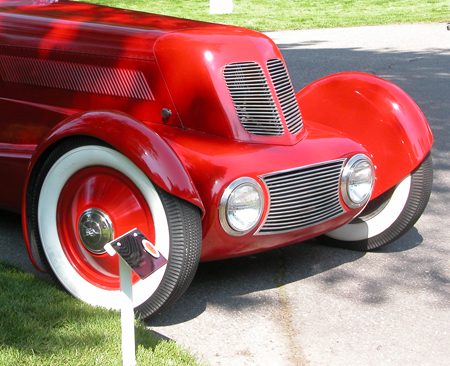 Exterior design was either handled by the body engineers and draftsmen or by outside consultants like the Briggs Manufacturing Co., which developed the 1935 and 1936 Fords. Even Lincoln did not have its first real in-house stylist until chief body engineer Harry Crecelius hired E.T. Gregorie in January 1931. Eugene Turrenne (Bob) Gregorie was then only 22 years old, although he had already worked at Brewster & Co. and (briefly) GM’s Art & Colour Section. Gregorie’s formal training was actually in boat design; he had been a draftsman at Elco Works, a New Jersey motor boat company, and after his stint at GM had designed yachts for Motor Products Co. However, like Edsel Ford, Gregorie had acquired an early interest in automobiles from his father, who had owned a variety of expensive European cars. Gregorie’s initial duties naturally focused on Lincoln, but he was shortly assigned to design a new small sedan for Ford’s English subsidiary. Gregorie’s rendering was a good deal more attractive than the rather homely version that had previously been developed and was soon approved for production, going on sale in the spring of 1932. 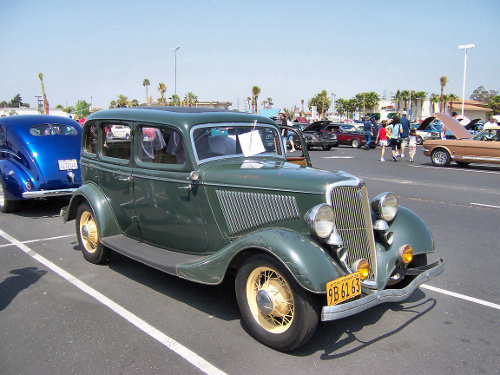 The Model Y, as it was called in Britain, was a great success and Edsel and Henry Ford were so pleased with it that they decided to adapt the design for the 1933-1934 North American Fords. Edsel and Gregorie quickly found that they had much in common. While Edsel was about 15 years Gregorie’s senior, both came from well-to-do families, both had a prep school education (although neither had gone to college), and both shared a love of boats and cars that went beyond prosaic business necessity. In Bob Gregorie, Edsel Ford had, for perhaps the first time, someone to whom he could fully express his ideas about automotive styling. Moreover, Gregorie could do what Edsel could not: transform those concepts into workable production designs. 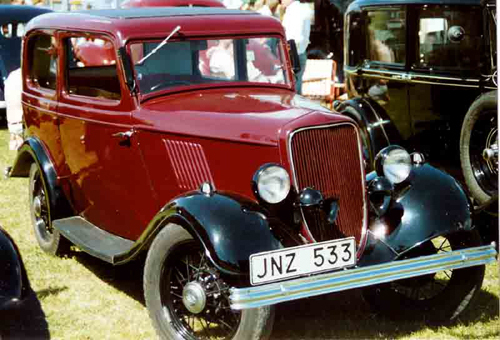 I assume that most of the Jensen-Fords were based on English Ford components, although the 1936 car shown here was a special case, since it was ordered by an American buyer with LHD. The grille does look remarkably like a postwar Pilot, but the Pilot also looks like an amalgam of mid-thirties V8 Fords. My guess, without doing more investigation of that particular car, is that it has the chrome grille from a 1936 Ford, possibly cut down to fit or otherwise modified (a simple enough exercise for a coachbuilder). Yet another interesting article Aaron! It seems it was a common usage for the big cats in Detroit (Harley Earl and others) to have custom, one-off cars manufactured by the company. Sometimes it was a concept car or a prototype they would take as a personal car. I read the very first Continental was a private order from Edsel Ford after a visit he did in Europe. It proved a good investment since it became a must among his acquaintances and eventually a marque. Yet my question is, as a rule of thumb, who paid for those hand-built specials? The guy who ordered them or the company? An excellent question to which I’ve never gotten a definitive answer. My best guess (as a generic answer) is that the company paid for the car and then sold it to the executive, presumably for a good deal less than the actual production costs. Automotive employees and executives are typically able to buy the company’s cars at substantial discounts, so there’s some precedent there. I also know of cases where certain special cars used for evaluation purposes were subsequently sold to employees, rather than scrapped. (One example was the small number of Jaguar XJ-S 3.6 cars brought to the U.S. in the eighties, while Jaguar considered whether or not to import the early six-cylinder model. They ultimately decided not to, but the cars had already been federalized, so Jaguar NA sold them to its U.S. employees.) And I assume that if a car was originally created as a drivable styling prototype or show car, the company is permitted to sell it once the car has completed its official functions — so long as it is or can be made street legal (obviously an easier process prior to safety and emissions standards) — just as businesses can sell off their surplus equipment or fixtures. If the car was one that the executive already owned and had customized by the staff, rather than being built from a bare chassis or body in white, the company probably charged them some fee for the work, although I suspect it would still have included some steep discounts on the actual material and labor costs. Doing it for free would pose some legal and fiscal problems (with the costs being treated as income, etc. ), but there usually aren’t a lot of restrictions on a company offering its employees discounts on its products and services as a perk. I know of top executives, whether in privately owned companies like Ford at that time or public ones, who don’t make a clear distinction between their own expenses and that of their company. What’s a benefit in kind as opposed to expenses needed of the job when it comes to traveling, eating at fancy restaurants, using the company car (and refueling it on the house). It was extremely common in France that corporations had their own repair shop (sometimes with a gas pump). Big cats had their car costs completely paid of. That practice was gradually eliminated with the IRS considering it as a salary and taxing it. So it stopped being economical for both parties. It was also common (and it still is although it became more difficult) that bosses manage to have lots of their personal expenses (house, yacht, and so on) paid for. Henry Ford was known for not being very ‘fiscally responsible’ either. Edsel’s fancy cars must cost fortunes. I wouldn’t be surprised if it was on the house. I always wonder when I see Harley Earl’s one-off vehicles as well. Just a curiosity. With Edsel’s personal cars, it appears that at least some of them were titled in his name (and the ones he still owned at the time of his death were considered part of his estate), which implies that he did actually purchase them from the company, rather than just having them as company property that he happened to drive around. What the purchase price may have been — and whether it at all reflected the actual production costs — is an open question. One interesting point is the customized landau sedan Gregorie said he had built for Edsel around 1938. Assuming that Gregorie’s recollections were correct (his interview with Dave Crippen was, after all, nearly 50 years on), he had that done on his own initiative, not at Edsel’s orders. Now, Gregorie indicated that his own salary at the time was not impressive, so it seems unlikely that he could have paid for that kind of work (which he indicated was rather expensive) purely at his own expense. Even if Edsel were otherwise in the habit of paying for the construction of his personal cars directly, one imagines he would be annoyed to be presented with a substantial bill for work he hadn’t asked for. That leads me to assume that Gregorie had the work done on his authority as styling director, drawing on whatever budget he had for styling prototypes. If Edsel hadn’t liked it or hadn’t wanted it, I presume it would have ended up scrapped or in storage, like other used prototypes. Since Edsel apparently did like it, he could have then arranged to purchase it, on whatever terms his accountants deemed appropriate. I wouldn’t be surprised if his other cars were done on a similar basis, but again, I’m speculating.